The 5055e is an entirely unique product because it is the only electrically operated wheel loader with all-wheel steering in its size class available on the market. The increased initial investment costs will soon be outweighed by the significant savings made from reduced operating and maintenance costs compared to a diesel-operated vehicle.. The highly tuned drive system makes it easy to maneuver the machine with precision. Thanks to a stacking payload of 1,750 kg, it is now possible to transport stone pallets using an electrically operated wheel loader. Stone pallets had to be split up with all previous vehicles. 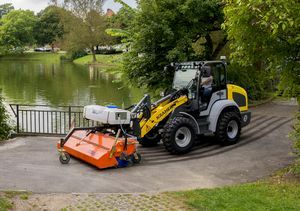 For the jury, it was important that Kramer not only presented a pure concept study, but also had a functioning, marketable eWheel loader in its product portfolio and was already supplying it. Moreover, according to the magazine "Maskinentreprenörens", there is no need to compromise on the 5055e, as the vehicle is on a par with a diesel-powered wheel loader. New technology: tried and tested quality. Thanks to the proven undivided chassis, Kramer wheel loaders are ultra stable in all conditions. Due to this special vehicle construction, there is no shift in the center of gravity due to steering movements. On the basis of the Ackermann steering, only the wheels move during steering. Thus, maximum payload and high stability is maintained even on full lock, and on uneven ground.